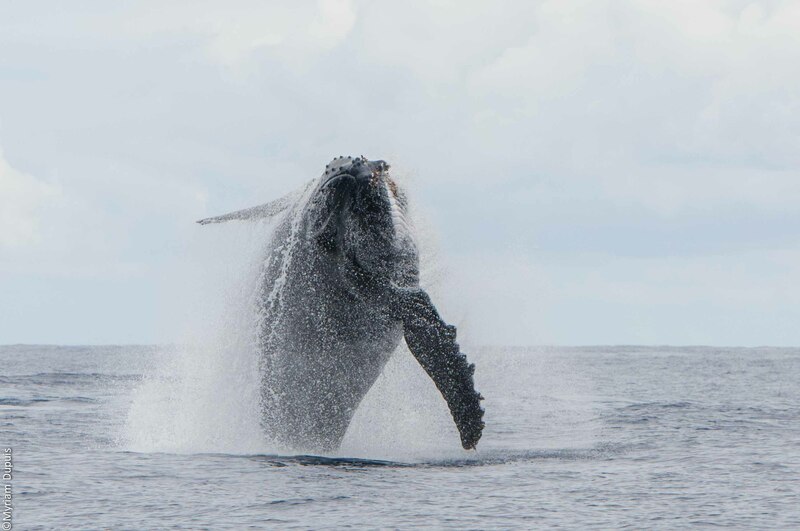 For some years, when the austral winter begins in the Reunion island, everyone tries to observe the first humpback whales of the season. The first individuals arrive in June or July, then pregnant mothers appear with singles looking for partners. All have traveled between 5,000 and 7,000 km, from the feeding areas of Antarctica to the tropical waters of the Indian Ocean. In these warm waters the humpback whales give birth to their calves and breed ... as scientists say. 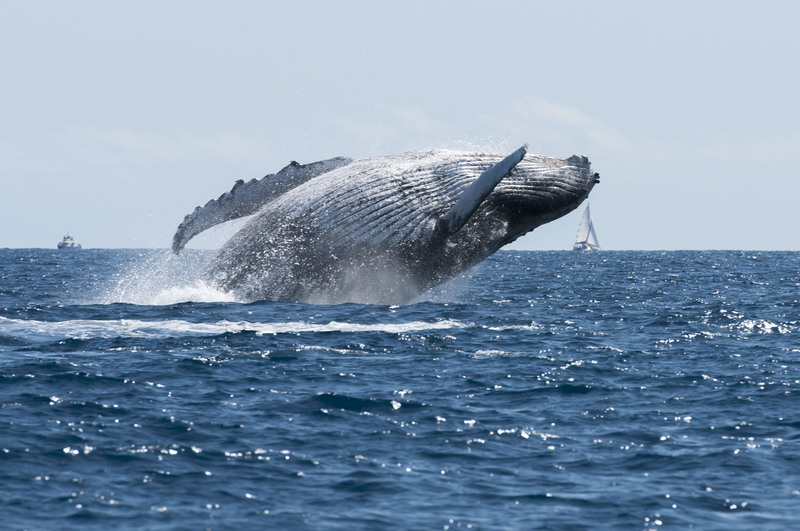 The whales sail around Reunion island, Madagascar, Mayotte before returning to the South to feed. They usually leave the warm waters between late September and mid-October. How to recognize a humpback whale? The head and lower jaw are covered with rounded protuberances called tubercles, which are hair follicles, characteristic of the species. These “knobs” come from the vibrissae of his ancestor called Pakicetus some 50 million years ago. Up to now, it seems that each knob includes a single hair. These follicles would be sensors indicating the quality of water such as temperature, salinity, deep. 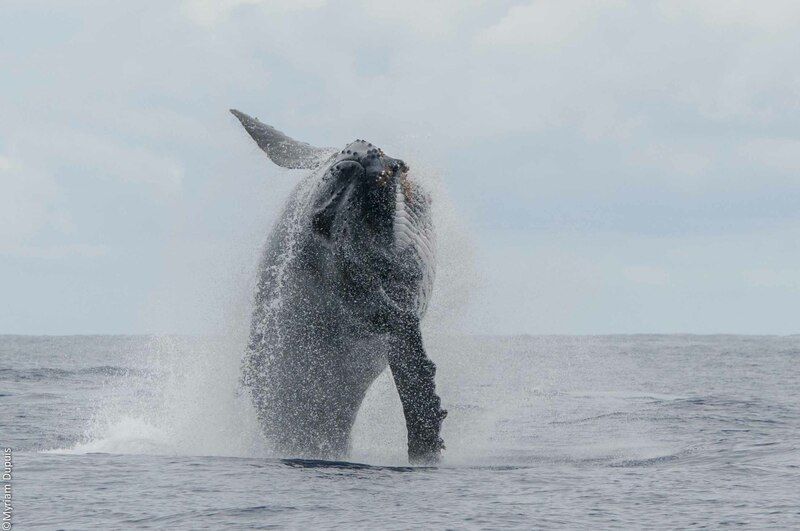 Finally, humpback whales are famous for their spectacular breaching that you are never tired of admiring. 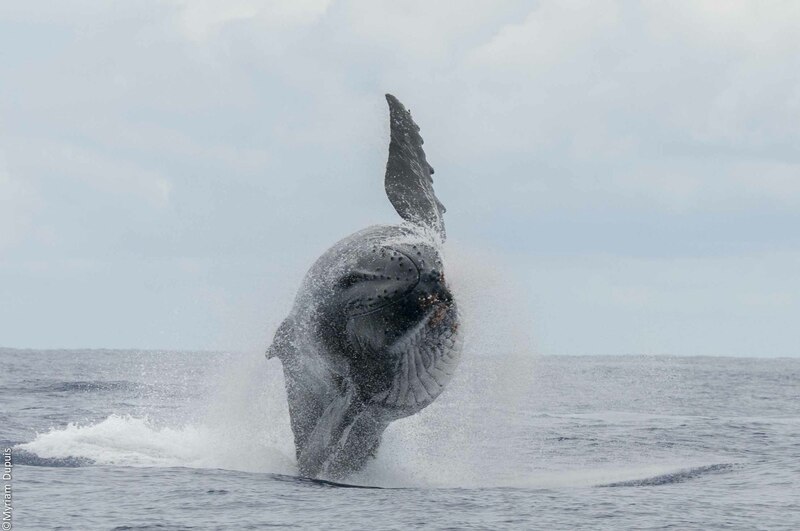 Described as “playful and joyful” by Herman Melville in 1851 the most acrobatic whale performs amazing breaching out of the water. To propel its thirty tons out the water, the humpback whale must reach the surface at a speed of 15 NM! It thus manages to make tendrils above the water, but these are not the only breaches it can do. It is not known exactly why they breach. In fact, it is such a good question that scientists themselves are still trying to answer it. There are a number of different hypotheses. Nevertheless, people mostly agree that this spectacular behavior occupies an essential place in their communication system. Breaching may be a way to communicate (“Here I am! Over here!”), by generating a large splash and a loud noise. Is this marking territory? a call? a complex game? or simply a show of strength? Behaviors include breaching, spy-hopping, lob-tailing, tail-slapping, fin-slapping, peduncle throws, charging and parrying. This has led to speculation amongst scientists that lobtailing is, like breaching, a form of non-vocal communication. A breach or a lunge is a leap out of the water also known as cresting. 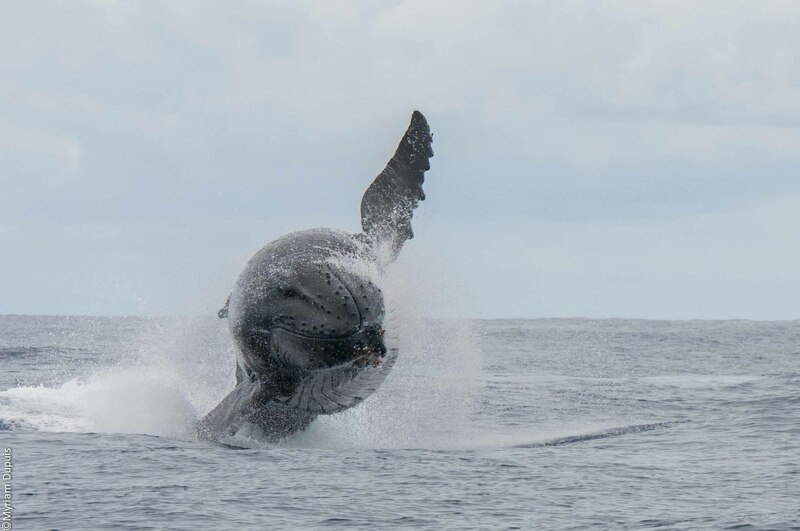 The distinction between the two is fairly arbitrary: cetacean researcher Hal Whitehead chooses to define a breach as any leap in which at least 40% of the animal’s body clears the water, and a lunge as a leap with less than 40% clearance. Spy-hopping is when the humpback whale puts only the head out of water, much like a periscope; its vision is both earthly and submarine. Is it to see or rather to hear what it does not see under water, like the specific sounds of the near shore? We observed a young whale calf poking out its head several times (“spy-hopping”), just before his mother did a full twist out of the water a twenty meters from him: teaching by observation? When spy-hopping, the whale rises and holds a vertical position partially out of the water, often exposing its entire rostrum and head. Spy-hopping is controlled and slow, and can last for minutes at a time if the whale is sufficiently inquisitive about whatever it is viewing. 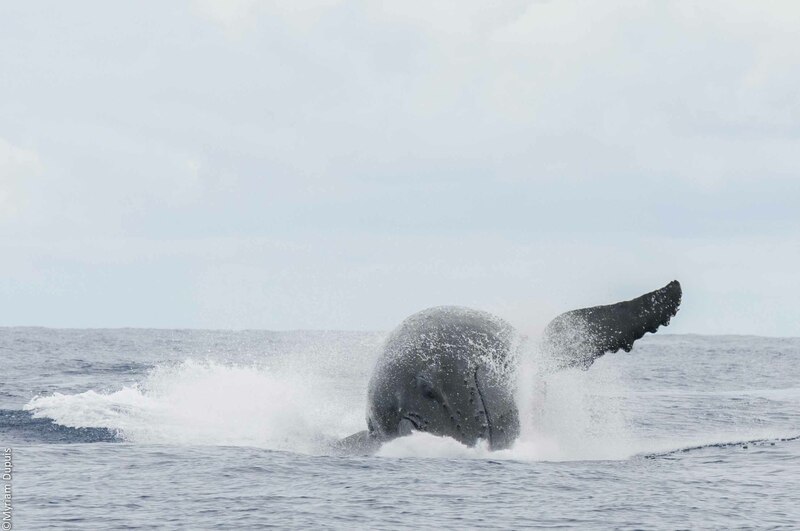 Generally, the whale does not appear to swim by fluke propulsion to maintain its “elevated” position while spyhopping, instead relying on exceptional buoyancy control and positioning with pectoral fins. Typically the whale’s eyes will be slightly above or below the surface of the water, enabling it to see whatever is nearby on the surface. Spy-hopping often occurs during a situation, where the focus of a whale’s attention is on a boat, such as whale-watching tours, which they sometimes approach and interact. Often spyhopping might not be used for looking but instead for hearing, for exemple in order to hear better when they are near the line where waves begin to break in the ocean as this marks out their migration route. It can therefore be said that spy-hopping behaviour is used for many different reasons across a wide range of species. Lobtailing is the act of a whale lifting its fluke out of the water and then bringing them down onto the surface of the water hard and fast in order to make a loud slap. Whales tend to lobtail by positioning themselves vertically downwards into the water and then slapping the surface by bending the tail stock. They are likely to slap several times in a single session. Lobtaling often occurs in conjunction with other aerial behaviour such as breaching. They may also slap their fin against the water for a similar effect, known as pectoral or fin slapping. The sound of a lobtail can be heard underwater several hundred metres from the site of a slap. This has led to speculation amongst scientists that lobtailing is, like breaching, a form of non-vocal communication. Thus the lobtail is probably important visually as well as acoustically, and may be a sign of aggression. One hypothesis of breaching is that whales are trying to shake parasites off of their skin. Another popular theory says that they might breach simply to scratch an itch. The impact of the animal hitting the water may have the same effect for the whale as a dog rubbing itself against a tree to try to scratch fleas off of its back. It is thought that breaching helps remove barnacles and lice from their skin. A whale when arriving from the Pole can have up to 500kg of parasites! 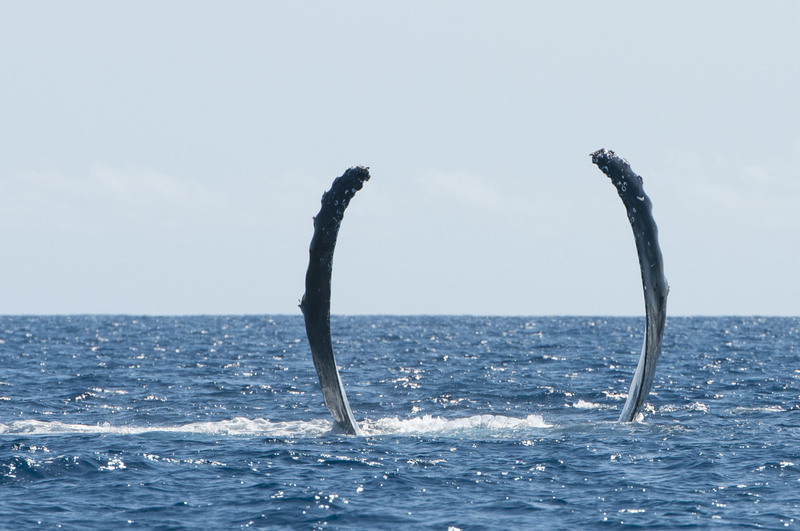 Acrobatics is not the only art that masters the humpback whale; it is also distinguished for its songs. The male is a Distinguished singer : it composes an annual real “tube” that it performs together with other males. It sings head down, motionless at 10-20 meters deep, or it moves slowly at 2-3 km/hour. This position seems to allow it to save energy for passing the air from his lungs to his laryngeal bag near his vocal cords in melodious back and forth, and without any bubbles. Without stopping to sing, the whale goes breathing on surface every 10 to 20 minutes and comes back quietly to its position. These compositions, among the most complex in the animal kingdom, seem to obey a score that does not leave room for improvisation. Discovered in the late 50s by the US Navy sonars, these “songs” were decrypted by Payne and McVay in 1971. The humpback whales are the only ones to have such a repertoire! The song is composed of sounds with very different resonances: acute squeals, more serious trumpet tunes, squeaks, whistles, clicks, screaming, humming, roaring, bellowing ... All these sounds are quite strange ! they constitute basic elements of the song : they are organized into sequences to form sentences that last a few seconds. The repetition of phrases (ten times) composed a theme. The theme is in turn repeated several times before the whale performs other sounds that will produce new phrases and new themes. A song is composed of about 6 themes that are repeated in the same order every time. At the end of the sixth theme, the whale takes its melody at the beginning of the first theme. These “songs” cover tens or hundreds or thousands of kilometers; they are produced by air movement within the respiratory tract of the animal, without no need for the latter to exhale: there is therefore no bubbles, making the phenomenon almost “supernatural”. That’s a good question! Because we can’t ask them, so we’ll never really know. Scientists have many hypotheses (or guesses?) as to why whales sing. 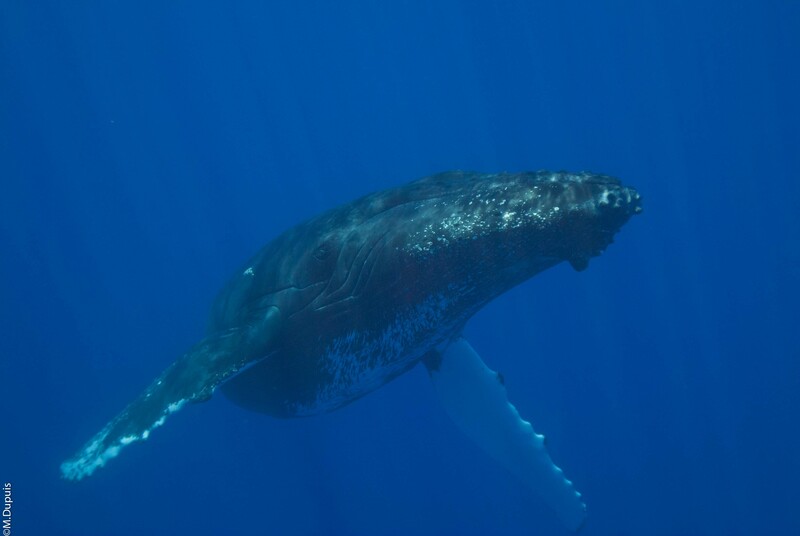 The Whale songs are assumed to have an important role in mate selection; however, they may also be used between males to establish dominance. Whales females do not either remain silent! And the calf vocalises to in response but is it really rehearsing ... or answering to his mother? 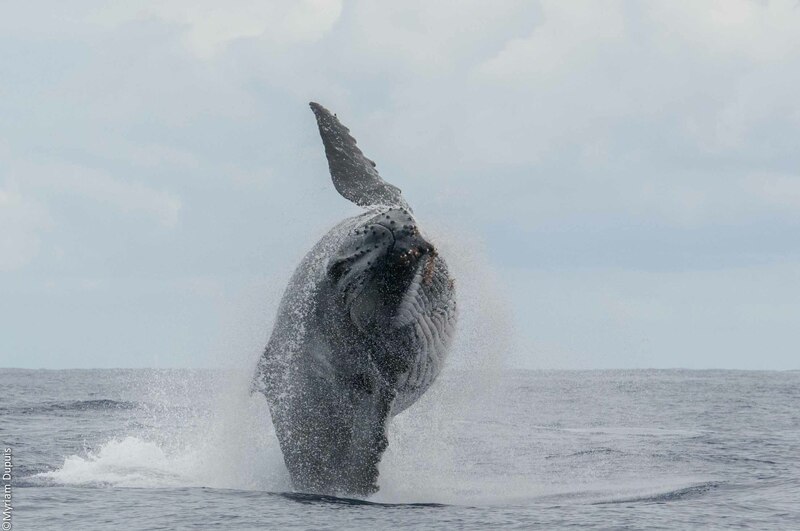 The humpback whale is a rather good-natured: it tolerates quite well our human curiosity, provided of course that we respect the current Approach Chart instructions in the Reunion island, to respect the animals and in no case to prosecute or harass them! 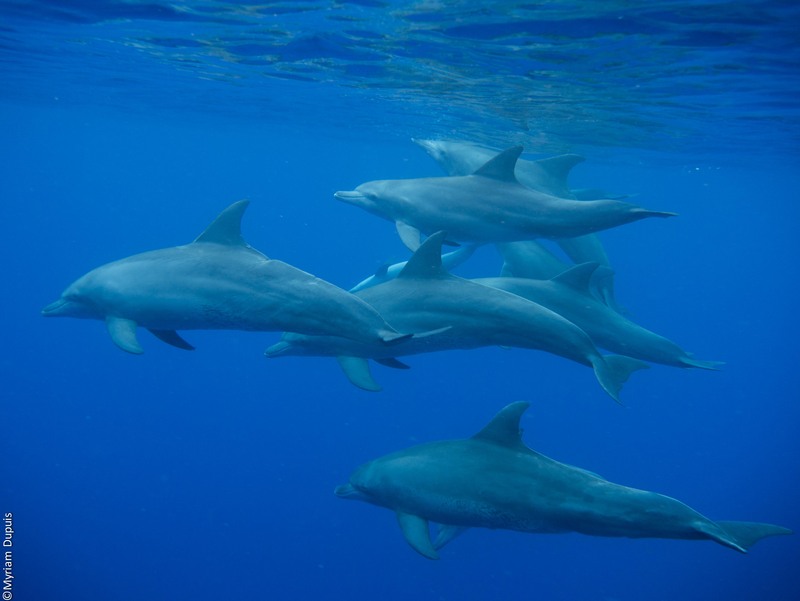 Sometimes, the Indo-Pacific dolphins swim around whales. Humpback whales are also known to appear in mixed groups with other species, such as the blue whale, fin whale, minke whale, gray whale, and sperm whale. Humpback whales also know how to stay immobile. Some individuals were observed remaining immobile on the surface for more than 45 minutes, but also vertically, upside down and the caudal fin to the outside, for 15 min. The latter attitude was seen particularly among breastfeeding animals. It can be also thermo-regulating, the tail being irrigated by many blood vessels, it would lower the overall temperature of the body, or why not? a rest position, but that is not innate: we saw whales calves training but to no avail! Their apnea last up to 30 minutes. We observed that when they are navigating, they breath every 6-8 minutes. 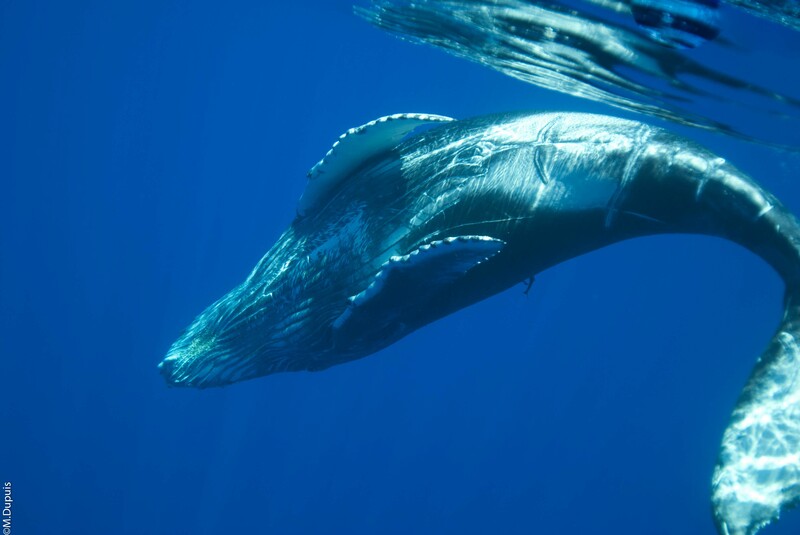 The humpback whales breathe voluntarily. Just over forty years after its creation in 1946, and after noting the near extermination (90%) populations of humpback whales, the International Whaling Commission established in 1986 a moratorium to stop commercial whaling, which 3 countries have still not signed and continue to hunt whales: Japan, Iceland and Norway. The Scientific Committee of the IWC now identifies populations of various cetaceans, includingthe humpback whales of the northern and southern hemispheres. 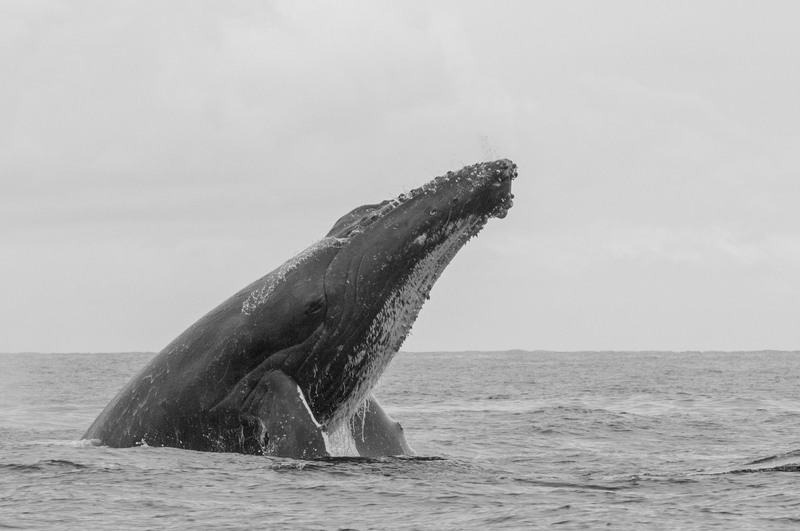 Although populations of humpback whales are doing better now, they are still facing many threats: hunting, of course, but also the underwater gas and oil and the mining exploration activities, construction and urbanization of coastlines and side effects of industrial fishing, and the global warming that rarefy their food. Do not forget all the questions still unanswered. 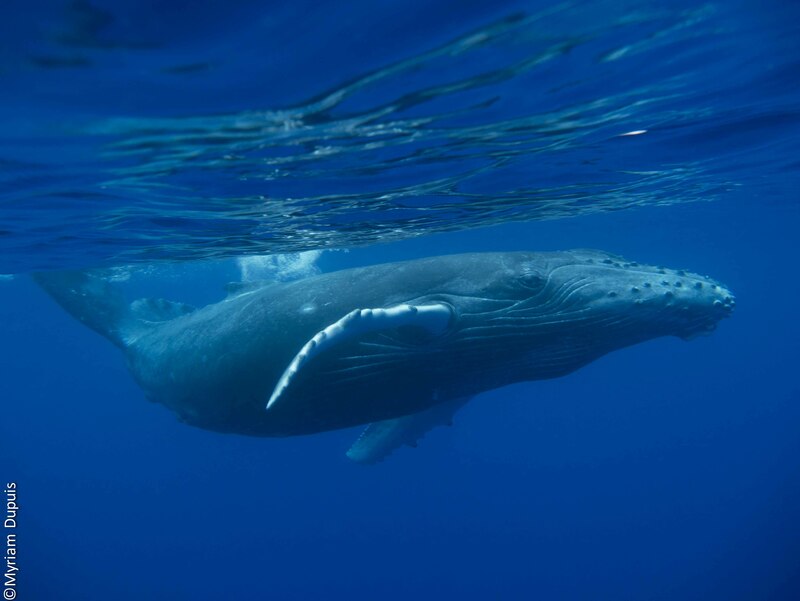 Because they live in an open environment, in a vast maritime domain, mostly underwater, humpback whales are difficult to observe and remain poorly understood. The researchers therefore emit more hypotheses than certainties. There are many questions, and every answer brings on new questions! To date, for example, no one has been able to explain how whales learn to sing: by imitation? By cultural transmission of “musical notes”? How and why they are changing their songs? Males sing only under two different circumstances: when they are alone, and when they accompany a lactating female. The songs are the same, but do they have the same goal? Watching and swimming with humpback whales is an extraordinary opportunity. They are exceptional ambassadors of the underwater world, then, please, let’s learn to respect their environment, our oceans, our seas, our rivers, our mountains, our countryside and cities by our daily actions! Thank you for them ... and for all of us!